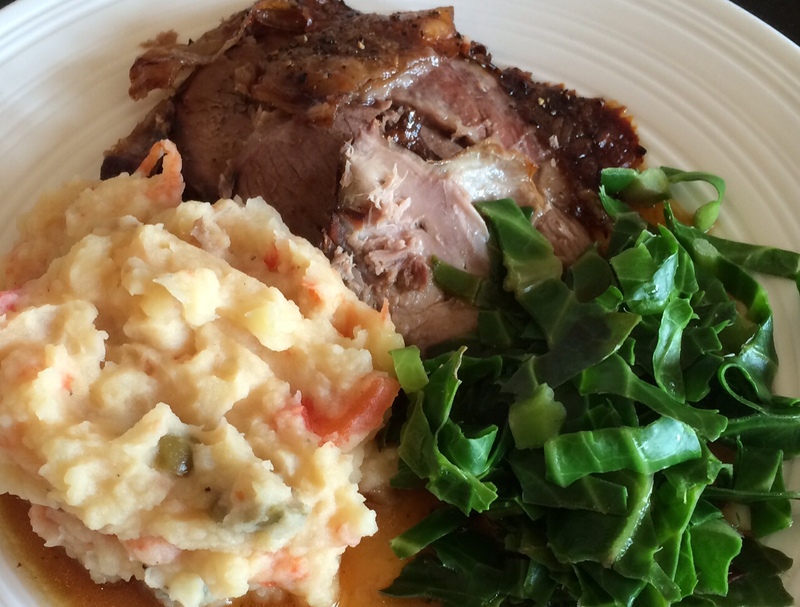 You can use either a shoulder or leg of lamb. Put the oven on it’s maximum setting. Put your leg of lamb in a roasting tray, fat side up. With a sharp knife slash the skin. Season well with salt and pepper. Add some rosemary (fresh if you can find it). Rub over some olive oil. Scatter some garlic cloves around it (skin on – you can add the roasted garlic to the mash later). Then cover the whole roasting tray with tin foil. As soon as the lamb goes in the oven, turn the oven down to 170 degrees. Now just leave it. Meet your friends for a drink maybe! Now get the mash going. Peel your potatoes (Desiree potatoes are good for mash if you can find them), put the kettle on. Put 6 halved tomatoes in the roasting tray for about 30 minutes. When the lamb cooking time is up take the lamb out and put on a big plate. Cover with the tinned foil and a couple of tea cloths and let it rest. Remove the tomatoes, the garlic and when cool enough squeeze out of their skins. When the spuds are done, drain them, add some salt and pepper, a knob of butter, a little milk and mash to the consistency you like. Add the skinned tomatoes and garlic and some chopped up olives and capers and the zest of a lemon. Season to taste. Put the kettle on and make up a pint of chicken or veg stock. Skim off any excess fat from the tray. Add the stock to the tray and have a good scrape around getting all the gooey lamby bits off the bottom. Then sieve into a pan and bubble away to reduce slightly. I’m making spring greens as a vegetable. They only take a minute to cook – plunge into boiling water. Pour your gravy into a serving jug. Now you’re ready to serve up. A nice bottle of Rioja will go well with this!